Our annual Sale-a-Bration sale is coming to an end this Sunday and before we know it, the new catalog will be here. These products will not be in the new catalog, so take a minute to see what Sale-a-Bration products you would still like to get. There were a few additional Sale-a-Bration releases in the last weeks. Sale-a-Bration Coordination will also end on March 31st. Those are the products that coordinate with many of our Sale-a-Bration items. There have been both Sale-a-Bration and Sale-a-Bration Coordination products that have sold out. There are still some great products to select and one of my favorite project ideas is shown below using the Home to Roost Cling Stamp Set. 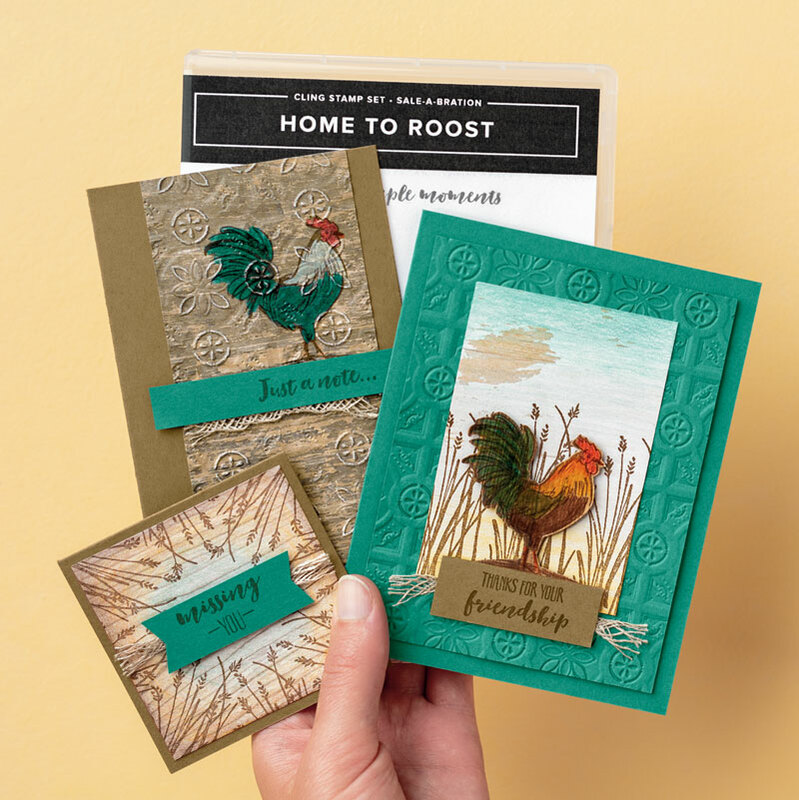 Click here to order the products used to make the cards and receive the Home To Roost stamp set for FREE. REMEMBER: Earn free product for every $50 you purchase (before shipping and tax), or host a qualifying party and earn free product based on your sales or best of all, join my team and not only earn free products, but add the new Craft and Carry Tote to your supply order. So as you can see, you have options to take advantage of during Sale-a-Bration. Act quickly before products are sold out and before the end of Sunday, March 31! Contact me with questions or for assistance with ordering.